As an environmentalist I have been a strong long time opponent of the use of nuclear power for the generation of electricity. This stems from the partial meltdown at Three Mile Island in 1979 in the US, the explosion and partial meltdown of the Chernobyl Nuclear Power Plant in the Ukraine in 1986, and the latest nuclear disaster at the Fukushima Daini Nuclear Power Plant in Japan. There are about 433 nuclear power plants currently in operation worldwide, the US having the lion’s share of 104 plants. But this represents only 19.3% of the total electrical output for the US and worldwide about 11.3% of electrical power come from nuclear plants. France generates the highest percentage of its electricity from nuclear power or about 77.1% from 58 nuclear power plants. So the 3 nuclear disasters represents less than 1% of all nuclear facilities. This might seem an excellent track recorded were it not for the fact that two of the disasters lay waste, through radioactive contamination, to hundreds of square miles of inhabited land and several communities for the foreseeable future. Under the right conditions a nuclear reactor could melt down forming a molten mass of radioactive material that melts its way into the earth until its fuel supply became spent or diluted releasing large amounts of radiation into our atmosphere in the process. In terms of efficiency in generating power, nuclear power has little equal in the concentration of power produced in conjunction with sustainability. Its primary drawbacks are potential disasters which can have gigantic consequences as described, the storage of spent fuel which remains highly radioactive for tens or hundreds of thousands of years, and the safe transport of new and spent fuel from the manufacture to power plant and finally to permanent storage. But then there is Global Warming which demands our attention more and more each day. This can turn into a human survival issue if not addressed seriously soon as a matter of urgency. Most alternatives for the production of electrical power are being focused upon wind generated power and photovoltaic cells (solar cell). But in order to be effective numerous huge farms of tens of thousands of wind turbines and tens of millions of photovoltaic cell must be produce, installed, and located along power distribution system to be effective. These devices will cover hundreds or thousands of square miles of the earth surface. There are even plans to place large wind turbine farms in the coastal oceans. Environmental concerns about wind turbine’s rotating blades killing birds exists so turbine designers have designed huge slowly rotating turbines to reduce such incidence. There exist environmental concerns that huge solar farms will cutting off substantial sunlight from large solar arrays that all the local fauna and flora depend upon for sustenance. So large solar and wind farms have their problems and must go through strict environmental reviews. The efficient collection of all this electrical power over large areas is also a challenge. These two sustainable no carbon alternative are also relatively new and expensive technologies. On the other hand nuclear power technology has existed for 70 years and much development has been placed on variations of this technology. It generates no carbon byproducts and other than the problems listed earlier is a very efficient, concentrated and abundant source of energy. Each plant occupies relatively little space but can generate enormous densities of power. It is a technological readily available today and has the capability of rapidly ramping up in the next 10-2o years to generating most of our electrical needs into the foreseeable future. The principles of nuclear power are well understood. Nuclear fission from radioactive isotopes generates heat. It is actually like a nuclear bomb exploding extremely slowly over years instead of a millionth of a second continuously producing low level heat energy. This heat is used to heat up water directly or some other fluid that then heats up water to run huge steam turbines that generate electricity. Radioactive fuel rods need to be changed about once a year once spent (do not produce enough heat to be effective) and stored somewhere for many thousands of year. This storage is a problem. Some are stored in deep salt mines in isolated desert areas. But there is no way that we can grantee safe storage for thousands of years. Radiation causes changes in the properties of storage containers resulting in eventual failure over many years. The best that can be done is to store this materiel far away from inhabited areas. There are basically two versions of reactor designs, high pressure and low pressure. Russia uses high pressure reactors which are more efficient at producing high quantities of energy and electrical power. But they are inherently more dangerous because of the high temperatures and pressures that reactor components must withstand. A single high pressure power plant can produce much higher power density electricity than a low pressure system. The US uses low pressure systems which are much safer with lower technical requirement due to the lower temperatures and pressures reactor components are subjected to. They are less susceptible to catastrophic meltdown disasters but consequently put out less energy density. Safety has always been a major consideration in reactor designs especially in the US. I think the Fukushima Daini Nuclear Power Plant was of US design so meltdowns are still possible. But the Russian built Chernobyl facility meltdown was far worst. All nuclear power plant meltdowns were due in one way or another to a breakdown in the supply of cooling water resulting in reactors overheating and generating hydrogen gas from residual water exposed to heat and radiation building up in the containment buildings and eventually exploding blowing apart the containment building and releasing large amounts of radiation, and damaging the reactor core. Reactors are not capable of exploding like a nuclear bomb because the concentration of radioactive materials is far too low (not enriched). So there still needs to be more design consideration put into more reliable water delivery systems and ways to deal with hydrogen buildup. The availability of this technology to significantly reduce carbon emissions, the cause of Global Warming, is quite appealing. Life is often about choosing the lesser evil to overcome a greater one, especially when survival is at stake. This seems to fit that bill. Nuclear power is very clean in terms of putting out no carbon and is reasonably safe. They already exist and generate about 10% of our electrical power. However there are potential problems. With more investments in research they can be made safer and more efficient. The safety concerns resulting from the transportation of new and spent fuel rods which may become critical if larger numbers of reactors come on line soon is real but I feel these are solvable problems. Nuclear power is a sustainable technology except for the long term storage issue. One nuclear plant would be equal to tens of thousands of wind turbines or millions of solar cells. However they need to be located next to large bodies of water such as large lakes or the ocean to obtain and expel large quantities of cooling water which may not be convenient for hooking up to power grids. But they are a very viable alternative to the use of fossil fuel to generate large amounts of electricity to quickly solve the Global Warming issue, soon to become a crisis. I’m not saying that nuclear power alone is the solution but I am saying that nuclear power has got to be a big part of the discussions and a major consideration to solving Global Warming. It simply makes a lot of sense based upon the urgency of the situation. However this should not be used as a reason for us to deemphasize our efforts to reduce overall energy consumption which is as essential as finding alternative sources of energy in order to become sustainable. This entry was posted in Alternative Energy, Environment, Global Warming, Science & Technology and tagged alternative, carbon, Climate Change, CO2, core, electricity, energy, environment, Fukushima Daini Nuclear Power Plant, Global Warming, greenhouse, Nuclear, nuclear power, Nuclear power plant, options, polution, reactor, rod. Bookmark the permalink. FG, I still oppose expanding Nuclear Power as a means of providing electricity. The issue of storage is spent fuel rods hasn’t been fully resolved. Most proposals indicate that Native American lands (low population, large landmass) would make ideals site for this, while ignoring the wishes and rights of NA peoples. Not only have Native Americans been shunted to desolate unproductive lands, but they land they are given is taken away for purposes like this. Livermore Lab’s security was recently lowered on Sept. 30, 2012, so the facility no longer is authorized to handlye, test or store nuclear bomb usable quantities of plutonium, including bomb cores. There is a proposal to ship plutonium bomb cores to and from Los Alamos NM to Livermore Lab, a move opposed by local nuclear disarmament group, like TriValley Cares. How do you feel about plutonium bomb cores being shipped near your home? Even thought nuclear power use is a small percentage of total energy production, due to security and environmental high risks, esp. as used for weapons of mass destruction production, I believe nuclear materials should not be considered as a viable energy source. I can perfectly understand where you are coming from. Until recently I was just as much against nuclear power plants as you. But I have been looking into Global Warming very seriously and it seems to be of some urgency. What if I told you that if we do not return CO2 emission back to 1950 levels globally within the next 10 years it may take more than 50-100 years for global warming to start to revers. During that time global warming will continue to increase. You need to read my series What is Global Warming (in 3 Parts) in order to understand what I am talking about. As Global Warming continues Secondary Sources of CO2 will continue to inter the atmosphere even after we return to 1950 or lower levels. The longer we delay effectively acting on this the longer the reversal and recovery and the worst Global Warming will become before reversing that eventually it will take so long that life will becomes extinct. I’m not saying that my numbers are correct but the sequence and relative durations are quite possible. My numbers may be too aggressive but on the other hand they may not be aggressive enough. We just do not know. So if we do not dramatically reduce our CO2 emissions your kid and grandchildren may be in for a very bad future. 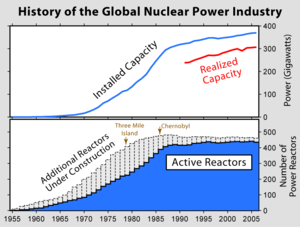 Nuclear reactors can be built now to replace carbon emitting power plants. Republicans cannot say that they will cause economic hardship if replacing old power plants with nuclear ones and if we can convince environmentalist such as you and formerly me that there is simply no time to do anything else to give our children and grandchildren a future then we must give it very serous consideration. Yes there are problems but people are cleaver and resourceful and solutions can be found. Spent fuel does not get hot enough to use in nuclear reactors but it is still very hot and can be used for other sources of secondary energy such as producing steam in a central facility near communities and distributed it to heat houses or do something useful. Technology just needs to be developed to use this spent fuel. I have some thought about this that I may later write about. There are ways to make radioactive materials decay faster by increasing neutron density while in storage. But eventually it must be stored. It will just be less radioactive. I can elaborate on this as will. So though spent fuel needs to ultimately be stored it can be done far more safely. There are solution or better solutions if we put resources into it. I agree with your concerns about military grade plutonium, etc. but that is another discussion altogether. I’m no fan of nuclear weapons or weapons of any kind (see my article US Sanctions, A Failing Foreign Policy).